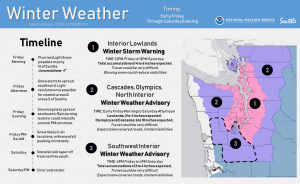 PORT ANGELES — The National Weather Service has issued a winter storm warning for the north Olympic Peninsula. 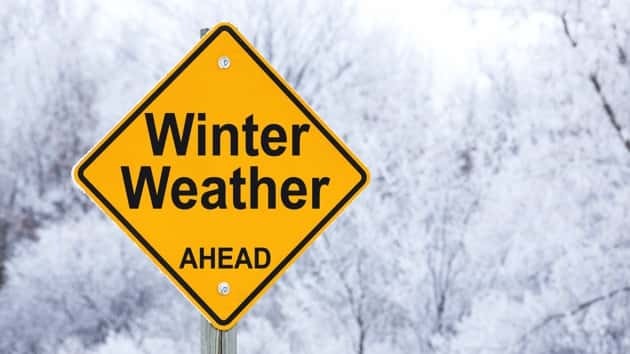 Forecasters now say north Peninsula lowland areas could receive more than a half foot of snow beginning Friday evening through Saturday morning. Hills above 200 feet could see significantly more snow accumulation. A storm fueled by arctic air is moving south into the area. Forecasters say it is a “snow-maker” for our area. It also will bring gusty winds. Northeast winds gusting to 45 miles an hour are expected. Emergency management officials are warning of unsafe travel due to blowing snow and dangerous, icy roads. Sunday will bring a mostly sunny, but cold, day. Another threat of snow comes Monday. Temperatures are not expected to rise above freezing for the next five days. Lows at night will be in the upper teens and low 20s.